Below is the painting and text of one of the animals in my ongoing project, Extinct & Almost Extinct: 50 Paintings. Today, the Takhis breed is the only surviving wild horse and is a genetically separate species from all other horses. Takhis means “spirit” in Mongolian and the horse is a symbol of Mongolian national heritage. They are a compact horse with strong necks and heavy limbs. Twenty thousand years ago people painted Takhis on the walls of Lascaux cave in France. For nearly 10,000 years they ranged over much of the plains of northern Asia, living in harem groups with a dominate stallion. However, by 1800, their range was reduced by humans grazing domesticated animals and hunting Takhis for meat. Before 1878, when a Polish explorer discovered Takhis in a remote area of Mongolia, these horses were thought to be extinct by the western world. Between 1880 and 1909, 52 foals were brought to the west and put in zoos. 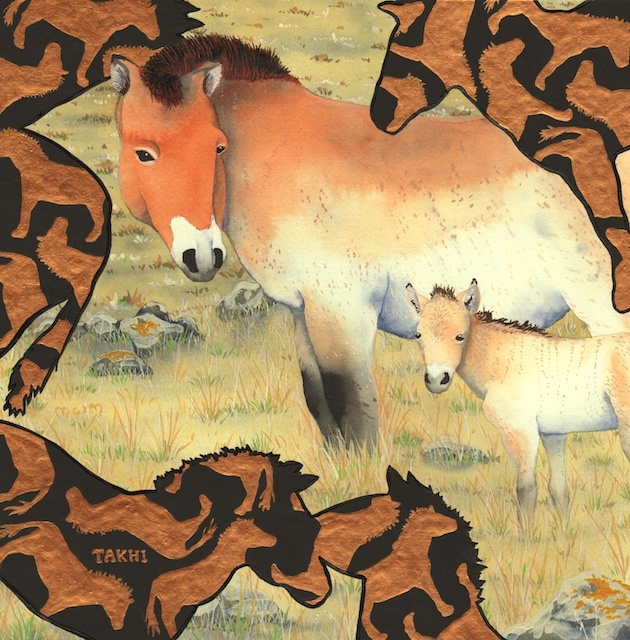 In 1968 the last wild Takhi was seen in Gun Tamga, Great Gobi B area and the horse was declared extinct in the wild. Records show that surviving Takhis are all descended from twelve animals brought to western zoos before 1909. From this group, successful breeding programs were developed in North America, Europe, China and Australia. By trading animals the widest diversity was achieved. In 1992, an enclosure was set-up in Gun Tamga, Great Gobi B to reacclimate zoo-bred Takis to the harsh Mongolian climate and to teach them to live independently. By 1997, this program was successful enough to open the enclosures and allow the Takhis to roam freely. A few zoo-bred Takhis were added to this group to expand genetic diversity, but most of the herd growth has been through new foals born in the wild. Of the approximately 2,000 Takhis living today, about ninety live in the 4,600 square mile preserve in the Gun Tamga, Great Gobi B. Another eighty live in preserves in Le Villaret, France and Khomyn Tal, Mongolia. The rest are in zoos around the world.